Deer have adapted so well to suburbia that they have become a nuisance and are destroying our landscape. Yes, they are beautiful and we sometimes enjoy watching them but who can afford to replace expensive landscapes because the deer have eaten it to the ground? One year they ate all my mature Hosta that I had painstakingly moved from my former home. I planted Anise Hyssop around my beds and discovered that the deer hated it! Now I have beautiful hosta and no deer! Below is a list of plants that deer will avoid. It came from my favorite gardener Mike McGroarty and his daughter, Amber with a few additions from me. As much as 90% of their water requirements are met by munching on lush greens and tender young, plant growth. Deer prefer high protein crops such as peas, soybeans, turnips, alfalfa and corn. They like trail mix. Fruit, nuts and seeds are especially important when the green vegetation starts to dwindle. Corn that you may put out for birds attract deer too. There are very few animals that can resist the sweet smell of apples. Deer are one of them. They will happily rip off the bark of maples, aspens and dogwoods. They get water from their bark and it sits heavily in their four-chambered stomachs, keeping them full longer. Now what do they avoid? 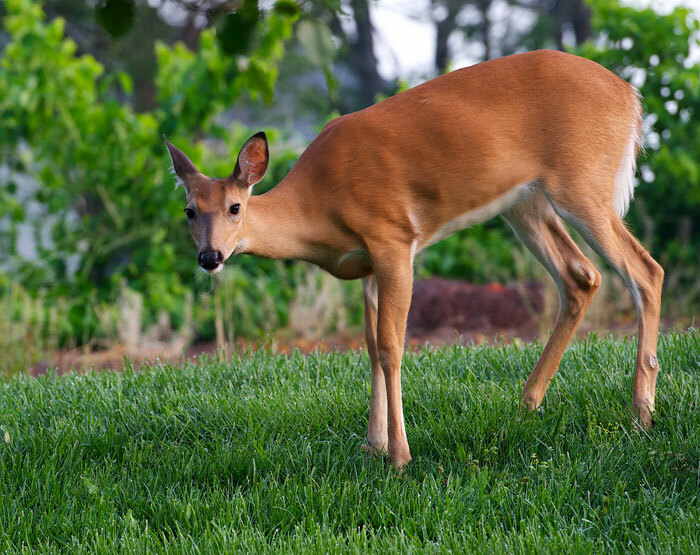 Deer avoid plants with milky sap and other plants that will upset their stomachs or give them heartburn. Deer prefer not to walk through sharp ornamental grasses or thorny brush to get to food. Okay, now what do they NOT like to eat. There are a variety of beautiful flowers, shrubs and trees that we can plant in our yard that deer are unlikely to do much damage to. This list is based on information collected from searching educational web sites, retail and wholesale suppliers’ recommendations, public forums and personal experience.